SIPPING from a glass of iced lemonade and looking a bit tired around the eyes, Rory Gallagher relaxed in his room in the Gresham yesterday afternoon. The previous night he had begun his current Irish tour with the first of four concerts in the Stadium and there was a small bit of a "party" afterwards to celebrate. Hence comes the tired eyes. “After Dublin (Dec. 27, 28, 29 and 30) we go down to Cork (Dec. 31 and Jan. 1) and then we have a short break before the Belfast concerts (Jan. 2 3,4, 5 and 6). About half of them are sold out already, and to judge from last night’s audience, it should be a real cracker of a tour." Obviously, to do well at home is still important for Rory, the former Fontana Showband guitarist from Cork, who has become one of the great international rock guitarists with a reputation to rival Clapton’s. He likes to spend Christmas in Cork and his annual Christmas concerts here, are by now, a traditional part of the festivities for Irish rock fans. "It's not a nostalgic thing— just because I'm Irish — although, of course, that’s part of it. But the real reason I come home to play regularly is that the audiences are great and I value the reaction I get from them." Rory is now approaching the end of an exhausting tour of 13 countries in little more than 12 weeks to introduce his new 3 piece line-up to the fans. His current tour has the kind of schedule that would reduce most musicians to a nervous wreck. But Rory seems to thrive on it: indeed he’s renowned among rock fans for always giving of his best at every concert even when he’s been on the road for weeks on end. Born in Ballyshannon, Co. Donegal, Rory was only two when his family moved to Cork. He went to several schools in Cork (mostly the North Mon ) and by the time he was 15 he was already a talented guitarist and a member of the Fontana Showband.. Formative influences he remembers listening to on the radio included Elvis and Chuck Berry and British skiffle - player, Lonnie Donegan, through whom he discovered the likes of Woody Guthrie and Leadbelly. through people like Ray Charles to discovering Jimmy Reed, Muddy Waters and Elmore James." Slowly he assimilated that love for the blues that still marks his playing.
" Although I decided myself to finish school, music was already the main thing in my life even then. It was often a case of arriving back in Cork with the Fontanas at 8 a.m., after playing the night before in Galway or somewhere, gulp-down my cornflakes and heading off to school. It was a good basic training for a life on the road and it's stood to him ever since, even in these days when he's globe trotting instead of traveling around Ireland. After the Fontanas, Rory formed the now legendary 3-man blues band, Taste, in 1966 and toured England and Germany supporting the likes of John Mayall and Cream. 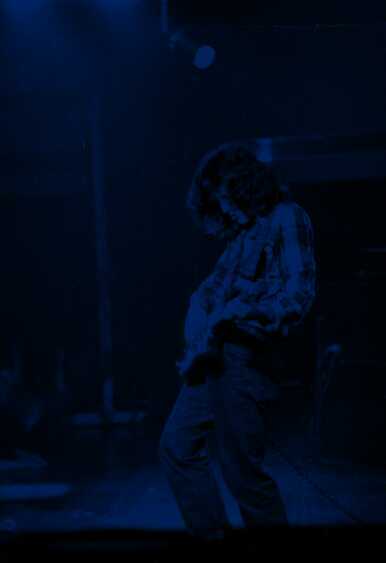 Taste, before it broke up in 1970, had already established a huge following on the Continent for Rory and with his new Rory Gallagher 4-man band in the early 70's he toured America, Japan and so on, becoming one of the most highly regarded rock guitarists in the world in the process. Success has never changed him, however. To talk to him now, he is still the same quiet, unassuming, friendly character he always was. His lack of pretension and his refusal to indulge in the usual rock star posturings are part of the Gallagher image: on stage as off, the approach is workmanlike- he still wears demins at concerts and he always gives the fans their money's worth. He likes to play down the "Hardworking Rory" tag now, but the fact is that four or five years ago, when the big rock bands stopped touring- "they got aristocratic about meeting people"- Rory was still playing away all over Europe and the States. Now that touring ( by the Stones et al) is back in fashion, the fans remember Rory's unselfishness. He has done 13 extensive tours of America, the lst one just before he arrived here in Ireland for the current visit. In spite of all the years on the road, he still enjoys it- especially in the States where he can follow his love of the blues to his heart's content.
" Most of our concerts in the States are in big theaters which close by midnight and that leaves plenty of time for us to go on to clubs. So I always look at the local papers, especially in the South, to see who's on. "I've often dropped into little clubs while we were touring in the South and found myself listening to some legend-for the price of a beer. I've jammed with Hound Dog Taylor in Chicago ( he's dead since) and I've heard John Hammond and Albert King, Albert Collins and a host of others." One of the most satisfying points in his career came some years ago when Muddy Waters was making his "London Sessions" recordings and invited Rory to join him on the album. "Some of the old bluesmen are a bit suspicious of young white guitarsits who are brought in on recording sessions. But Muddy was the warmest person you could meet: he used to hold up the sessions until I'd get back from wherever I'd be playing and then we'd jam into the small hours. "I used to learn just from watching Muddy tuning up. It's a dying art what the old bluesmen are doing because by the time it's been filtered through rock it's never quite the same." On the road Rory likes to avoid a set pattern, but he avoids the usual amusements of the rock fraternity, especially the drugs. "I won't want to pontificate about it, but I just don't take drugs. In fact in many ways, I don't feel myself part of the rock world at all." And there are always the unexpected happenings that break the monotony of touring and give everybody a laugh, he says. "For example, I remember the night we played Madison Square Garden in New York with the Faces in 1972 and halfway through the first number my amplifier went up in flames. The crowd went crazy assuming it was all part of the act, and when I smelled smoke and looked around, there were all theses stagehands spraying my equipment with fire extinguishers!" In fact, Rory's stage presentation is relatively low key. "We don't go in for smoke bombs and the like, although we're using more lighting now- but I don't like the Cecil B. De Mille approach." His main ambition remains to crack the American charts. "We play to much bigger audiences over there than some people who get albums into the top ten. I like to think that it's only a matter of time for me and that, like Bob Seger, for example, we'll eventually break through on the charts." At the end of every tour, Rory likes to relax in his flat in Fulham in London, where he has lived for a good few years. " I don't have any relaxing hobbies- the way Bing had his golf- and, in fact, I usually relax by mending guitars and amps: my bedroom is full of them." "There are always a lot of mundane things that need to be done after a tour- clothes to be cleaned and equipment to be repaired. I see some movies and read a bit, but I'm never very far from the music. It's a labour of love for me, " he says. The background is a picture taken at Lancaster U. in the UK by Maurice Finn in 1975, mutated by roryfan.